Lovejoy defense made all the difference in the win over Sherman. 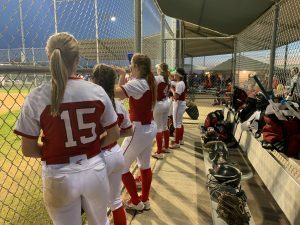 4 double plays by the infield, solid catching behind the plate, and clutch pitching in the circle made for a frustrating evening for the Lady Bearcats. The first double play came off of a line drive to Leah Taylor at shortstop who then doubled off the runner with Rebecca Holiman at 1st base. The second double play came off a bunt pop up to Delaney DiCristofaro who doubled off the runner at first base with Carlee Schaeffer covering. The third double play was off of a hard hit ground ball to Taylor, once again at shortstop, who tossed over to 2nd base to Schaeffer, and on to Holiman at first. The last double play erupted the Lovejoy stands, bench, and field as it ended the ballgame. The bases were loaded with 1 out in the bottom of the 7th. Sherman was down 0-4 with Sydney Provence in the circle. Off the bat, Taylor was hit a rocket ground ball, tossed to DiCristofaro at 3rd for the fielder’s choice out, then DiCristofaro sent a rocket of her own to Schaeffer at 2nd for the last out of the game. Sydney Provence and Bailey Bradshaw dueled in the circle for the Lady Leopards and Celeste Soliz handled all the catching duties. Soliz was a wall behind the plate, not allowing a passed ball with runners at 3rd base several times in the ballgame. Neither pitcher gave up any extra base hits. Lovejoy scored 4 runs on 11 hits and played perfect defense. Sherman scored no runs on 9 hits and committed 6 errors. Mackenzie Mitchell, Leah Taylor, and Sydney Provence led the offensive charge for Lovejoy. Mackenzie Mitchell went 2 for 4 with a double, stolen base, and scored a run. Leah Taylor went 3 for 4 with a run. Sydney Provence had 2 hits on the evening. Carlee Schaeffer went 1 for 3 with 1 RBI. Rebecca Holiman, Madeline Robinson, and Holly Massey all had 1 hit each. Massey, Soliz, and Schaeffer all drew walks in the game. Lovejoy is 6-1 in district play and will play McKinney North on Friday. Currently, McKinney North is in 1st place with a 7-0 record, but Lovejoy is on their heels in the hunt for a district championship.